← I’m really, really mad! My little big guy is nearly 3 months old and he had been holding his neck up by himself for about a month now; of course his head is so a little wobbly but that’s to be expected as his neck muscles develop and get stronger. I can barely believe how fast time is passing. It is so exciting hearing him start mimic-babbling and imagining what his voice will sound like and what his first word will be. I think of how amazing it will be to watch him start crawling , then suddenly stand on his own, and to take his first steps. Thinking of these life events is so thrilling but also a little heartbreaking because when they do occur he won’t be a little baby anymore. Oh the pulling on my heartstrings as I write this! Geez! 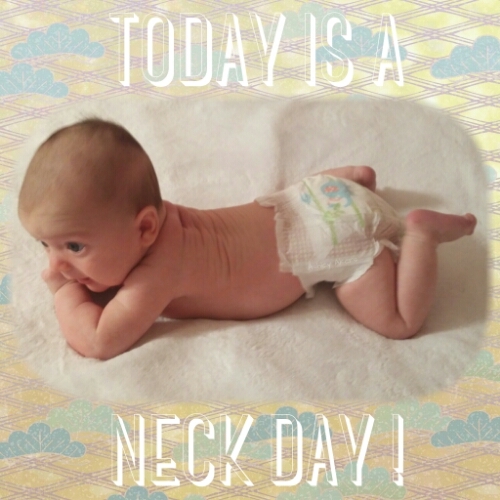 This entry was posted in Fourth Trimester, Newborn and tagged babies, baby talk, neck day, newborn, tummy time. Bookmark the permalink.